Protestors block the road during a protest on Wednesday after two grand juries decided not to indict the police officers involved in the deaths of Michael Brown in Ferguson, Missouri, and Eric Garner in New York. On Wednesday night, thousands of New Yorkers took to the streets to protest a Staten Island grand jury’s decision not to indict police officer Daniel Pantaleo in the killing of Eric Garner. One often-expressed complaint among protesters was that Garner died while being arrested for the fairly minor crime of selling loose cigarettes — hardly a capital offense. Cracking down on minor crimes is a central tenet of the “broken windows” approach to policing, the theory that getting tough on small violations (property crime, turnstile-jumping, graffiti) can help reduce more serious crime as well. Backers of the strategy credit it with helping to bring down crime in New York and many other cities to record lows in recent decades. There’s a long, complicated debate over the broken windows theory, including whether it unfairly targets minority communities and whether it works at all. But there’s also a much more specific issue as it relates to the Garner case. Many critics of the New York Police Department argue that Tompkinsville, the Staten Island neighborhood where Garner lived and died, got more police scrutiny than it deserved based on its crime rate. The data suggests the critics have a point. The New York City Police Department collects data on criminal complaints by precinct, broken down by the level of the alleged offense — felonies, misdemeanors and “violations,” which are minor crimes such as harassment, disorderly conduct and possession of marijuana. We can use felonies per capita as a measure of the serious crimes people are most concerned about. Violations per capita, meanwhile, is a measure of broken windows-type offenses, which usually involve more discretion from the police. (The data we’re using lumps together cases where a police officer witnesses a crime directly and cases where a member of the public calls in a complaint. A police spokesman said most violation-level offenses are witnessed by an officer.) As the chart below shows, there’s a strong relationship between the two: Neighborhoods with more felonies also have more minor violations. That’s what we’d expect in a city using the broken windows approach. None of this necessarily means police are being unfair to Tompkinsville residents. It’s possible the area just has a problem with minor crime that police are trying to tackle. It’s also possible its residents — or others nearby — are more likely than those in other parts of the city to call and complain about quality-of-life violations, and that police are responding to those calls. But there’s one other piece of evidence that Tompkinsville residents had a difficult relationship with police even before Garner’s death. The city also counts complaints against police. Once again, there’s a strong relationship between an area’s crime rate and its rate of complaints. 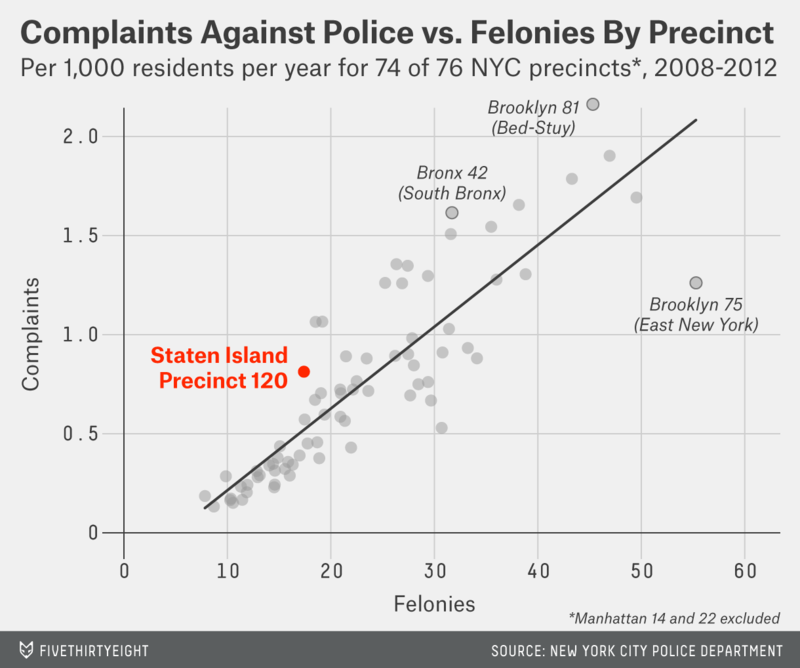 And once again, Precinct 120 is an outlier: It has a higher rate of complaints against police than would be expected based on the number of felony arrests there. 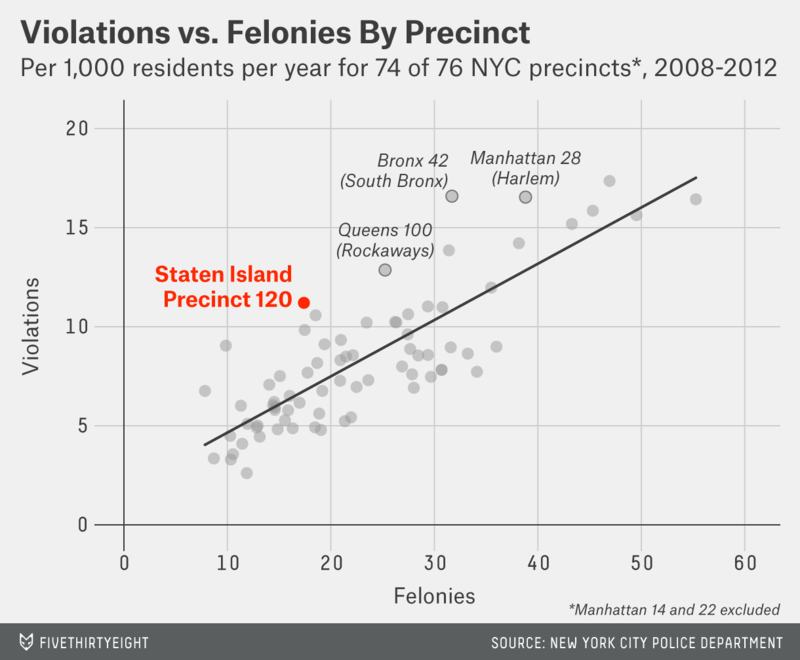 Notes: In 2013, New York added a fourth precinct in Staten Island, bringing the city’s total number of precincts to 77. This analysis is based on the pre-revision boundaries. Our analysis excludes two outlier precincts: One is precinct 22, Central Park, which has virtually no permanent population. The other, Precinct 14 in midtown south, is a business district with such a small residential population that its per capita crime rate is badly skewed.